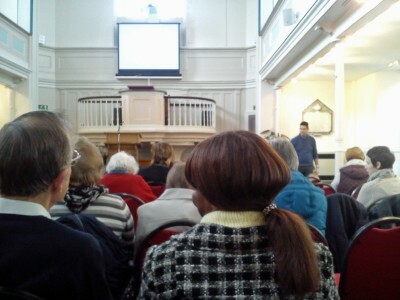 Members of Chard Baptist Church meet in different ways throughout the week. Many belong to house groups, which are a source of fellowship, discipleship and support. Sundays are the time that we all seek to gather together to worship and learn more about what it means to follow Jesus in today’s world. Our worship is an informal time of singing, prayer, bible readings and discipleship led by our minister and members of the church. We celebrate communion usually on the first Sunday morning of the month. It is a time where we remember all that God has done for us in Jesus’ life, death and resurrection. We seek to be as welcoming as possible, with wheelchair access, a loop system, and all words in large print if needed. On Sunday evenings we have a programme of services. Details and locations of Sunday evening meetings are found here, but it is always worth checking the Sunday Page – linked to on our homepage – to get the most up to date information. Please note there are no evening services held at CBC during the school summer holidays. We are also currently running Space on a Sunday in the Welcome Bap coffee shop on alternate Sundays (resuming again in September). This is somewhere for people to come in on a Sunday morning, get coffee and croissants, share worries and joys, chat about life and God with our friendly volunteers.